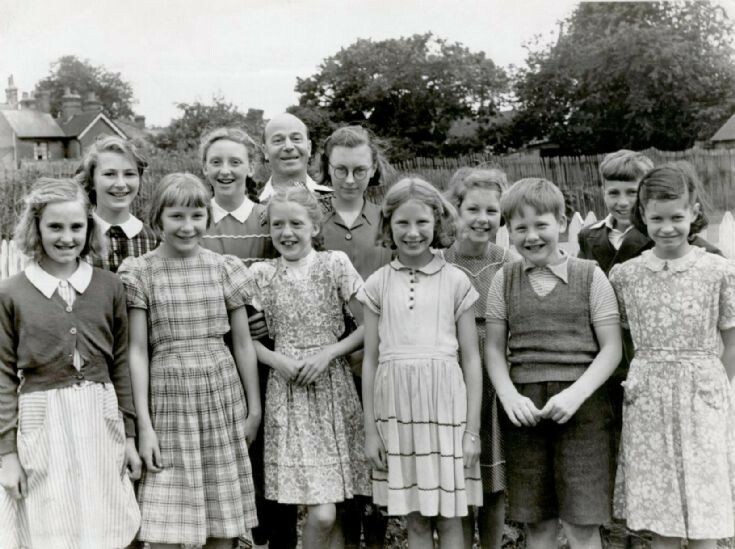 This photograph of happy boys and girls was taken at the Handcross Horticultural Show in 1954 and was taken on the piece of land between the Parish Hall and the bowling green, looking southwards. The picture shows many of the prize winners in the junior classes for handicrafts and cooking. Back row:- Sally Ray, Heather Weller, Bert Mitchell (Committee member), ???? ?, Doreen Kemp, Norman Leppard. Front row:- Bridget Biggs, ???? ?, Rosemary O'Shea, Joy Greenfield, ???? ?, Susan Spink. There are tentative suggestions that the two un-named in the front row could be Sheila Rye and Evan Gough. Please can anyone help with the names? This just leaves the girl in the back row to identify. Suggestions received from Sally Pugh (née Ray)and Suzanne Bolton (née Copeland) include Rosemary Waite, Felicity Foulkes, and Pamela Peasley. What a great photo of people born about the same time as me - so clear and lovely to see the names.